Matsushita's National JR 100, released in 1981, was apparently the direct predecessor to the JR-200 and only released in select territories, like Japan and New Zealand. 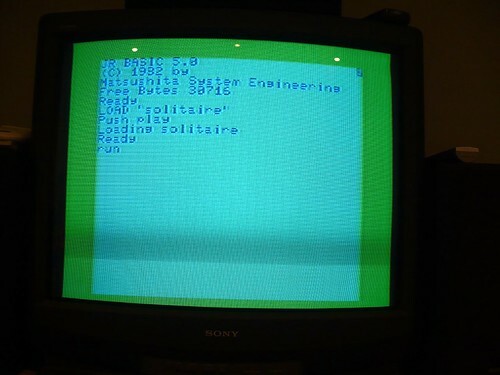 The diminutive system appears to have the same approximate capabilities as the ZX81/Timex Sinclair 1000, meaning not much (black and white display, limited sound, not much memory, etc.). 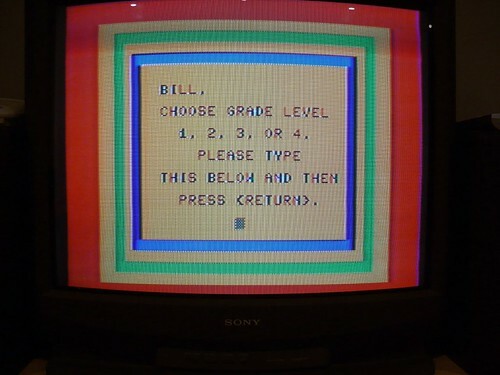 This system was apparently followed one year later in Japan by the JR 200 (JR.200, JR-200), which had the ability to display eight colors, utilize a high speed cassette and process sound on three channels (it appears it was not backwards compatible, though this is unconfirmed at this time). 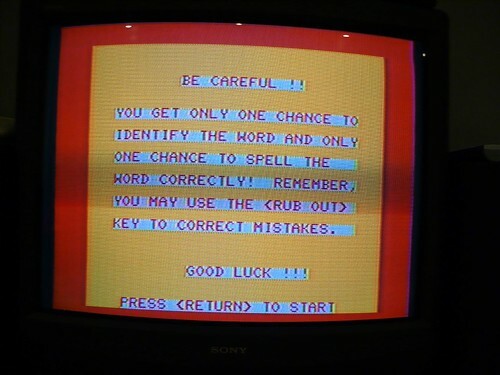 Unfortunately, much like Mattel's rather wimpy Aquarius (1983) and other select color systems in the same class, visuals were limited by the lack of graphics modes, instead relying on the manipulation of text, in-built characters and the occasional block. While this could work better than one might think - the most creative uses on the various systems that were limited by this from the mid-70's onward could occasionally simulate convincing graphics - this was a severe limitation in light of the then hot and/or forthcoming personal computer systems from the likes of Apple, Atari, Commodore, Texas Instruments and Radio Shack that had no such liabilities. 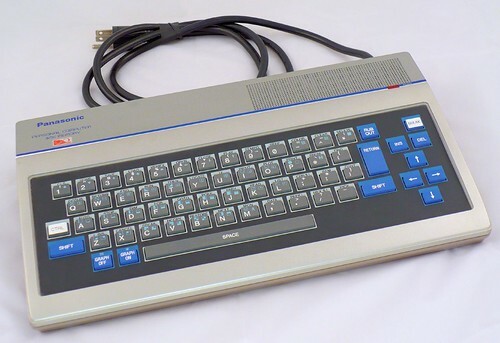 Nevertheless, Matsushita, also known as Panasonic, released the JR-200 to other territories, including the US, by early 1983 at a fairly competitive price point of around $300 (this was just a bit before the Commodore 64 came to trounce the low end market on price once-and-for-all after a stinging series of price cuts). Fastest computer in the low price category, and also one of the most accurate, is the Panasonic JR200. At $300, this is a remarkable performer. And a vintage article on one of the peripherals for the system, the Panasonic JR-02P. 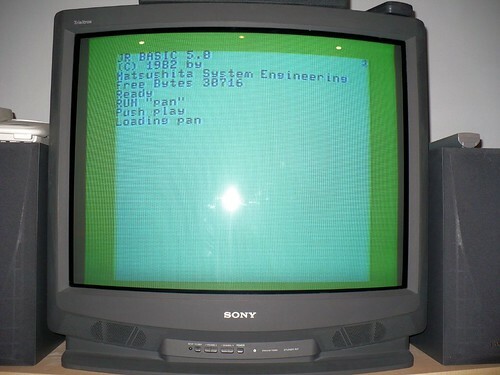 After acquiring one of my own Panasonic JR-200U systems not too long ago, with its built-in power cord/supply, standard cassette cables and cable-ready television cord, I was on the lookout for some type of manuals. Normally the Web is the collector's best friend in this regard, but there is precious little information available, and certainly no readily available PDF scans (with my particular interest being in the vagaries of the built-in BASIC language). I came across a Website that wanted to charge $16 for a few of the PDF manuals, site unseen, but that's so unreliable and so against the way it's supposed to be, that I passed. Instead, I stumbled upon J&R Music World, of all places, apparently offering both the Service and User's manuals, which the phone rep assured me, despite bad descriptions, that these should be the items I'm looking for based on model number. Bizarre, but in the world of collecting, you sometimes take what you can get [UPDATE: J&R has informed me via e-mail that the two manuals are back ordered due to "high demand". Ahem. I'm assuming that there's a chance now that they're not coming at all]. I also had separately eBay'd some cassette software, which I'm happy about, since I hadn't even heard about this system as far as I can recall, ever, which is pretty surprising since I've all but immersed myself in personal computing history over the years. I may have bought up the last supply of recently available software on eBay, though I have a permanent search in place in case there are any other hits (I've also only seen one other system available, but it's overpriced at $299.99, with no apparent room for negotiation--I got my system for well under $90, shipped, with little competition). 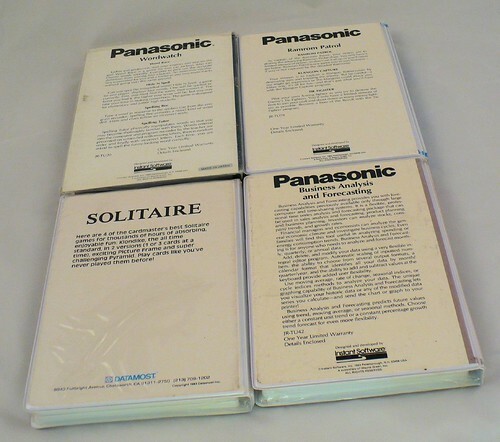 All of the software appears to have been published by Panasonic in variations of either a plastic or cardboard snapcases. 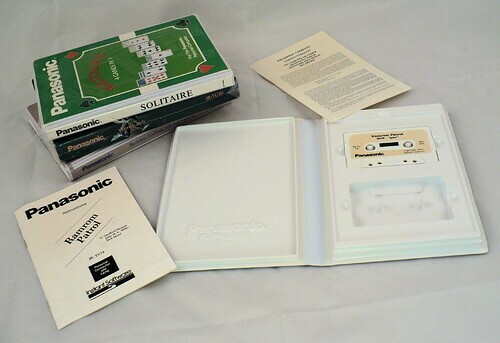 My meager collection includes boxed copies of the following software on cassette: Solitaire (Datamost, 1983), Ramrom Patrol (Instant Software, 1983), Business Analysis and Forecasting (Instant Software, 1983), and Wordwatch (Instant Software, 1983). 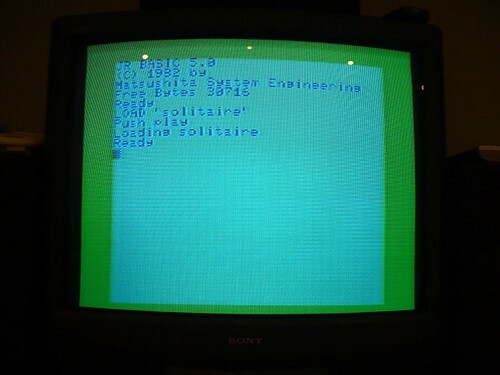 Datamost is obviously very familiar to 8-bit computer users, with the company being particularly prolific on the Apple II, going as far back as the days of commercial entertainment software being sold in Zip Loc bags. Instant Software sounds familiar from back then, but I can't immediately place them. 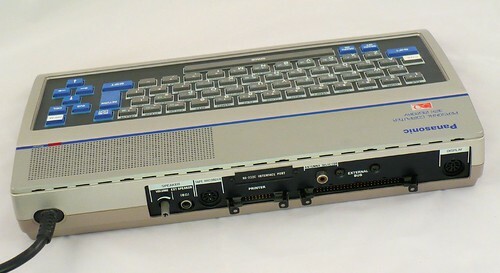 The Panasonic Personal Computer, showing the 32K Memory and "infinity" labels on the upper left of the unit. The built-in speaker is on the upper right near the Power light. The keys are the rubber chiclet style typical of lower end systems of the day. Touch typing is impossible, but these widely spaced chiclet layouts did allow for overlays, though I'm unaware of any being released. 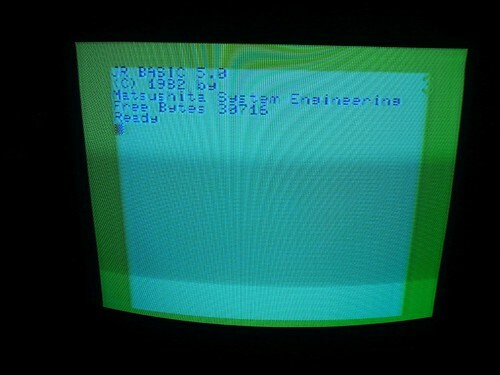 Additional programming and program loading codes are listed on the keyboard, apparently accessible from the CTRL key. The keys themselves contain typical alpha-numeric character sets and provide access to the built-in graphics characters, shown in blue. The left side of the system, with removable caps/covers over the Atari-style joystick ports. The rear of the unit. 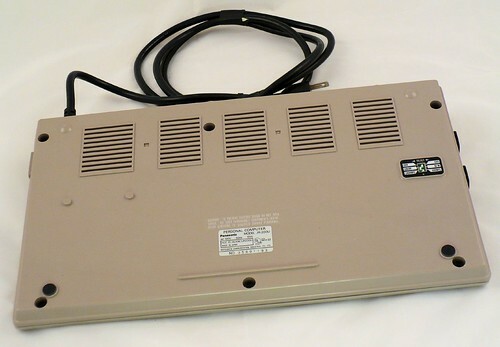 From left to right: Speaker volume, external speaker output, Tape Recorder cable connector, blank RS-232C Interface Port, Printer port (proprietary? ), Antenna/TV Selector output, External Bus (proprietary? ), and Display. My unit did not come with the Display cables, which appear to be the same output as Commodore 64, TI-99/4a and other systems in that same class, but did come with the Tape Recorder cables, which appears to be the same as those for the TRS-80 and similar systems. The right side of the unit, with the on/off rocker switch. The bottom of the unit, showing the unusual dip switch panel. The three dip switches select between channel 3 or 4, color or black and white, and 2400BPS or 600BPS cassette speed, respectively. The higher cassette speed is apparently only possible with Panasonic's proprietary cassette drive, which I don't have. For software on cassette (the only type that may have ever been released as far as I can tell), one side is the standard speed and the other side is for the high speed. All of the software I was able to acquire to date. 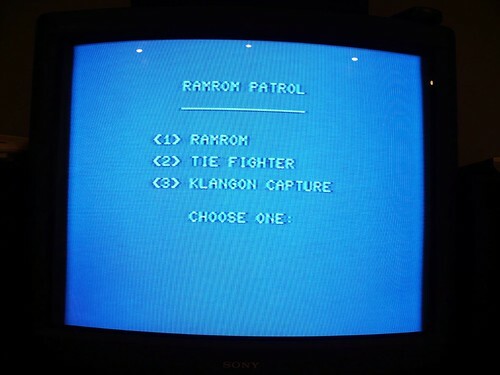 Everything came sealed except for Ramrom Patrol, which is a collection of three separate games. The rear of the software packages. All of them are rather bland, with an obvious lack of screenshots. The aforementioned cables. On the left are the cassette cables and to the right are the Antenna Selector (TV output) cables. 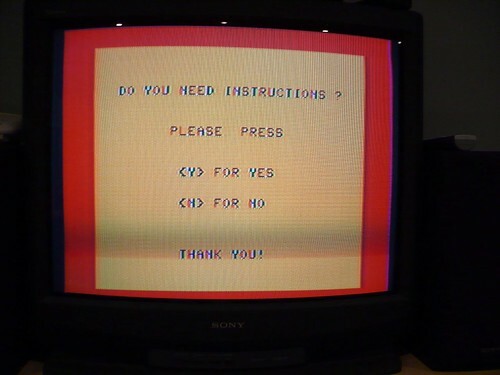 I may bypass that entirely and just use my Commodore/Atari/TI/etc. monitor cables, since it appears to be the same type of output on that port. To finish off, I hit the "GRAPH ON" key to access the blue graphics commands on the keyboard and just typed a few of the characters. 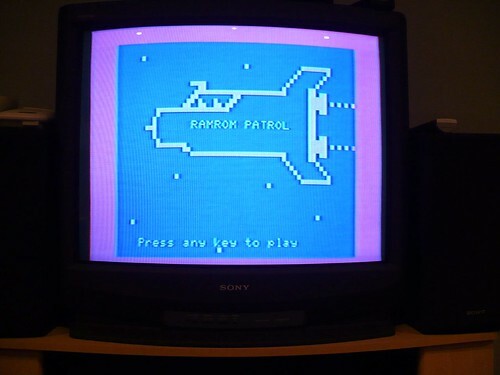 At this point, I figure it's time to try some software, so I get one of my tape players out and hook it all up, inserting the Ramrom Patrol cassette (600BPS side, naturally), since that box is already open (and frankly, that's probably also the most intriguing software to me). I follow the instructions for cassette hookup, with the white cable on the output (EAR), the black cable in the remote (REM) and the white cable in the input (CMT IN/MIC). I also follow the instructions for setting the tape player's audio volume (three quarters, or 8 to 10) and tone (high). I hold down CTRL and press R on the Panasonic keyboard. I then type "pan" in quotes and press RETURN. I then follow the prompt to press PLAY on the tape player. 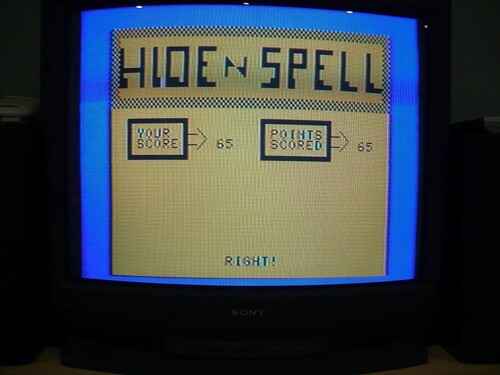 After several seconds, it says "Loading pan", with a display in the upper right cycling through the character graphics (I suppose to indicate loading). Luckily, after about a minute, I get a fairly slick animated Panasonic title screen, where it then shifts to a text-only secondary load screen, then the main menu. 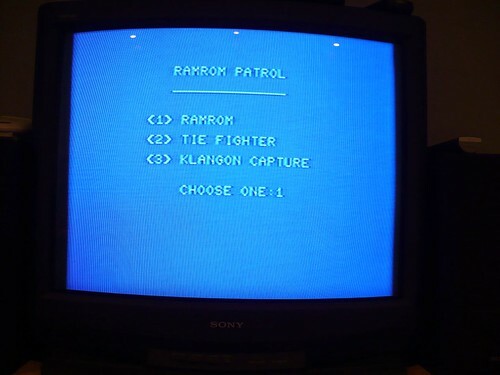 There are three games on this tape: Ramrom Patrol (RAMROM), Tie Fighter (hmm...) and Klangon Capture. I press the mythical any key to play. 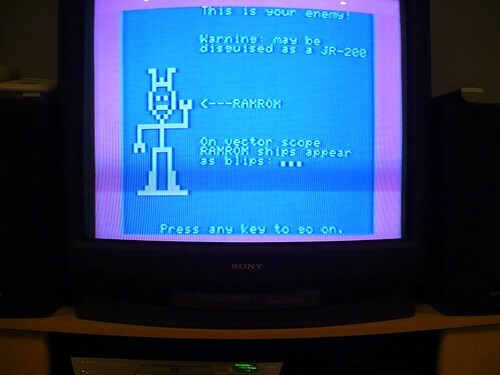 As you can see, for 1983, this is quite primitive. 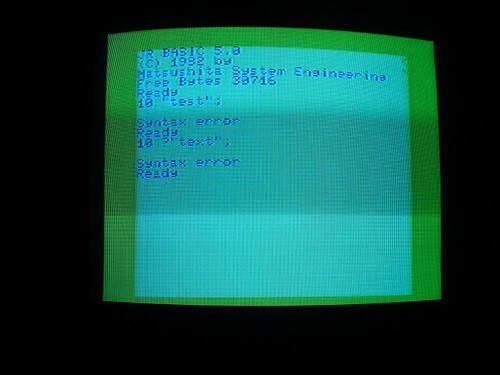 The visuals are reminiscent of the black and white TRS-80 Model I, which of course came out in 1977. 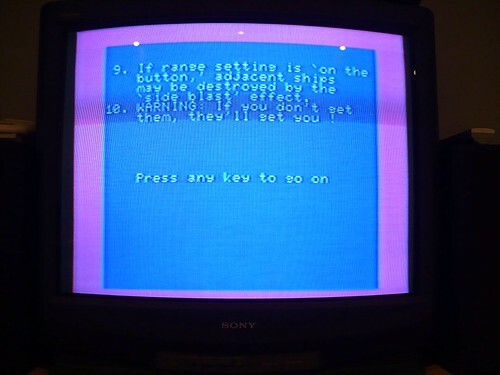 Of course since this is probably a BASIC program, the only way to exit would be to shut off the computer and re-initiate the long loading sequence. I'll pass. To test my theory though, I'll try to initiate a break by trying various CTRL and other key combinations. Success! I do a program listing. A surprisingly large amount of BASIC code and I actually get to see how the PRINT statements work. It looks like extra spacing helps. 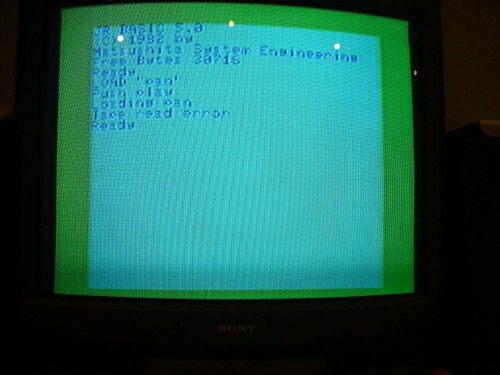 In any case, back in the old days, this was sometimes referred to as having access to the source code, so you could modify the program to your liking. For others, it was just an indication of lameness that a commercial program was being offered in BASIC. 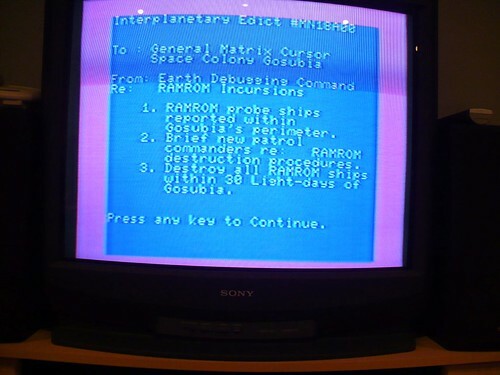 The manual indicates that RAMROM automatically loads, but selecting either of the other two games loads them both at the same time, then a sub-menu will allow you to select the one you want. Obviously the latter two are much smaller games. I'm not keen on trying them on for size at this time, so I'll move on to the second most interesting program. I turn off the computer, remove the black REM cable from the tape player and rewind the tape (Blockbuster would proud). 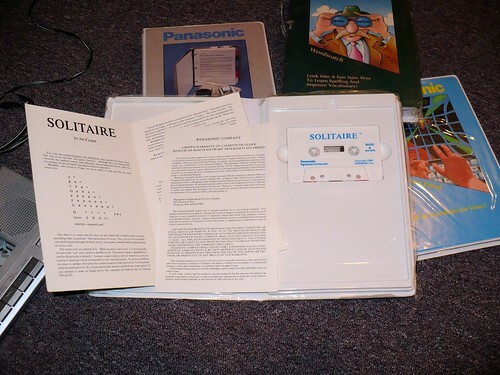 I then break the seal on Solitaire and insert the cassette, restoring the connection and starting the computer. Upon opening the package and seeing the instructions (this time with a slick exterior, but no interior pages other than the cover insides), I note the distinct lack of information on how to load the program(s). Pretty amazing omission if you ask me. So I do my best guesswork and try CTRL 4 (LOAD) and type "solitaire" in quotes, fingers crossed. Interestingly, the cassette stops spinning right after I press Play on the recorder. Apparently these cassettes come rewound on the 2400BPS side, not the 600BPS side. I quickly unplug the black cable and rewind the tape. I hook it back up and push Play on the recorder again. It looks like it may have worked, as I get a Ready prompt. I type "run" and press RETURN. Again, it cycles through all the characters in the upper right to indicate loading. After a few minutes, I'm presented with honest-to-goodness graphics in the title screen, with animated card changes. For a system without real graphics ability, it actually looks rather good (perhaps the initial loaders on these are machine language routines?). Funny too that it says "Written by: Eddie Kantor" and "Concept by: Art Carpet". In the manual it just says "by Art Carpet". Seems to me the guy actually doing the coding is more important than the guy saying, "Hey, why don't you make a solitaire game, Eddie? ", but that's just me. 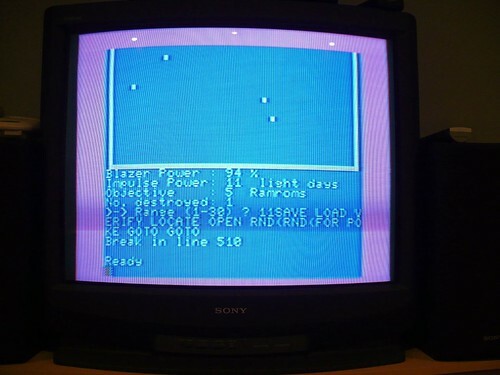 Anyway, just like RAMROM, this takes many, many minutes on this screen to finally load the game, whose actual title screen is nowhere near as impressive. 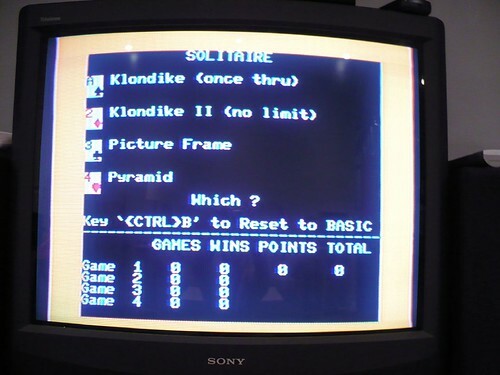 I press the SPACE bar as directed and am presented with four options, and a Press CTRL+B to reset to BASIC: Klondike (once thru), Klondike II (no limit), Picture Frame and Pyramid. 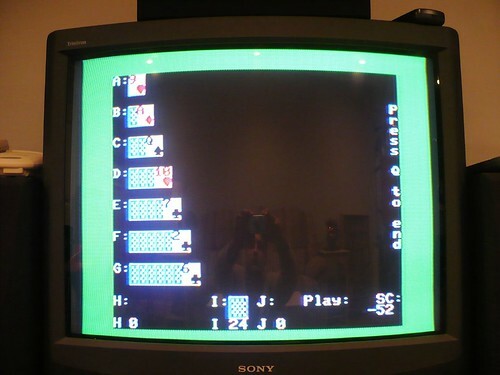 Obviously three solitaire variations, which are confirmed by looking at the manual. Admittedly, I don't really remember how to play solitaire (so shoot me already), so I just choose the first option to see how things work. This actually has a thick manual, similar in design to Ramrom Patrol's. There are even the same type of detailed loading instructions. Also looking at the manual, it looks like this program supports an Epson MX-80 or Okidata M-80 printer for graphical chart or graph output (no mention of Panasonic's own printer for this system). Fat chance I'll be trying that, but at least the program has made an attempt to support a "feature", something the other programs so far have distinctly lacked. Interestingly, even though this was sealed, it was actually rewound on the 600BPS side, meaning it's pretty hit-or-miss with how this stuff was packaged. I do the load routine (another "pan", with the manual failing to mention having to type "run"! ), anxiously awaiting what the pre-load title screen will look like, as that has been the most exciting part of this go-through so far. I try again and this time it works. Another loading error! The manual states adjusting the recorder's levels (they should be fine), cleaning the tape player's heads (no thanks) or trying the 2400BPS side might work. I'll try the 2400BPS side, since the 600BPS side is causing issues. This one is in a different box -- cardboard instead of plastic. In fact, the tape even looks different -- black instead of white. 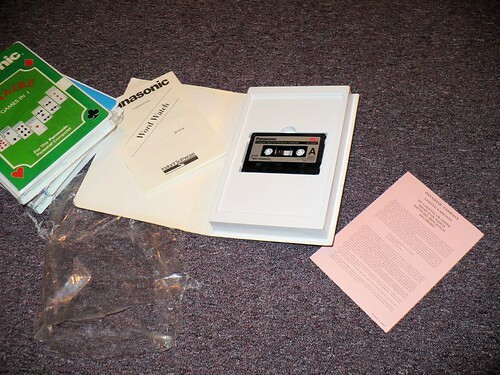 The manual is the same as the other Instant Software-developed titles, except the interior is badly cropped at the top. 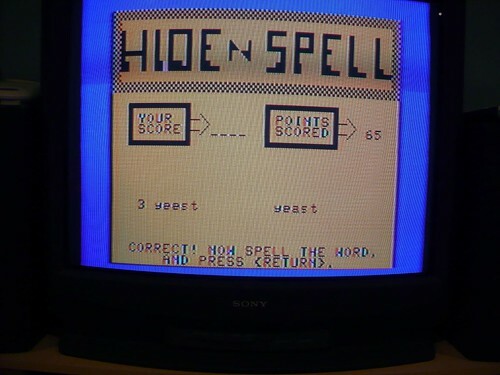 The manual indicates four game variations: Word Race (two players only), Hide N Spell, Spelling Bee and Spelling Tutor, foreshadowing much suckage since so far the mantra has been quantity over quantity, and has the same type of loading instructions as the other two software packages, except in an unexpected twist, they want you to substitute "loader" for "pan" this time. No fancy loading screen this time. 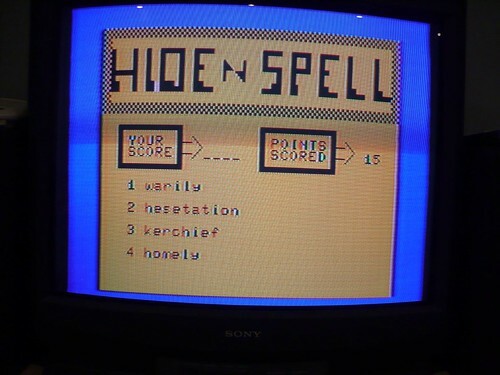 Just the text of "Word Watch" and then the menu, shown below. 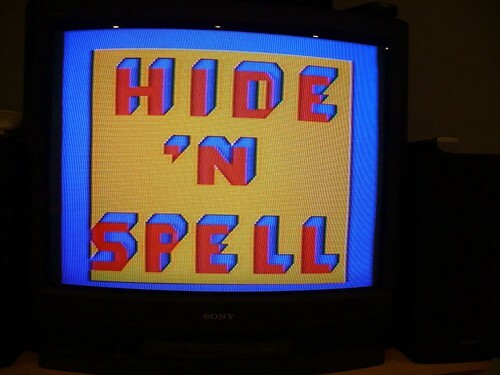 Not expecting much of anything, I select "HIDE 'N SPELL" as my test program. After more tedious and very, very lengthy loading (easily 10 minutes+! ), I'm finally presented with the title screen and some beeps of variable length timed to the title screen appearing word after word. Fun, truth be told, but the combination of no graphics and simple beeps and tones means it lacks much staying power. Regardless, it's about the most amount of fun I can expect from what I have thus far for this system, so that's enough for me for now. I think it will be fun to attempt to program on this platform, but until I get some other, better and more ambitious commercial software (assuming there is any), I doubt I'll be putting much more time into it anytime soon. 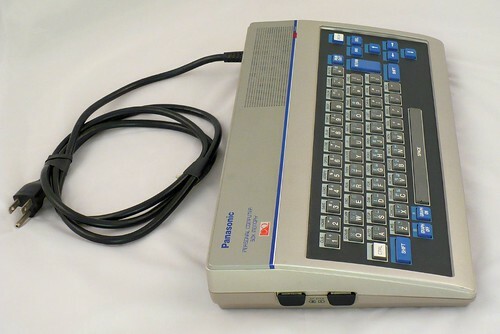 Two years in the making, the Panasonic JR-200 computer was officially announced in January of 1983, with additional launch dates provided for the computer and peripherals. The JR-200u received early and strong support from two software publishing companies; Data-Most and Walt Disney Telecommunications. 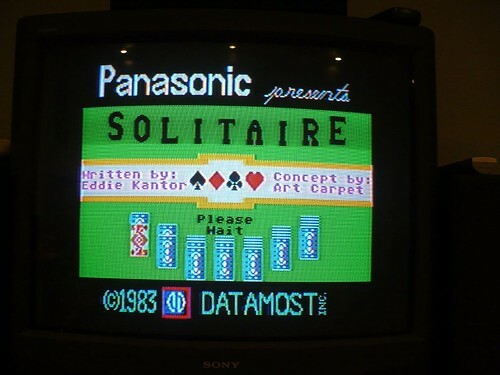 Having the support of both of these companies, especially Data-Most, was crucial in Panasonic's strategy to successfully market this computer, as well as it's plans to have 30 software titles available by the official launch in the spring of 1983. 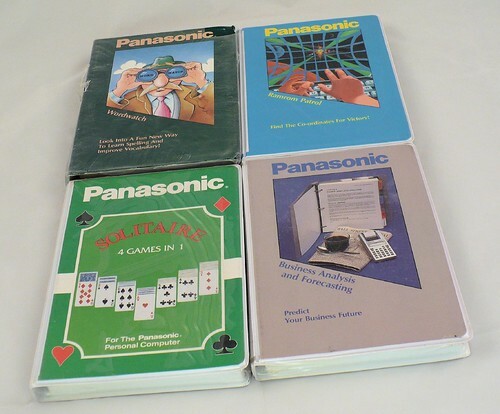 Additionally, Panasonic planned for an additional 24 titles to become available by mid-summer of 1983 by consulting with other software developers. The computer and all of it's accessories were to be sold as part of Panasonic's marketing strategy in traditional channels and specialty stores. Beyond that, Disney would market it to educational institutions as part of its educational product line. Print advertising was set to begin in February of 1983 with television ads set for the third quarter of 1983. In March of 1983, Panasonic introduced the JR-200u into the United States market with a suggested retail price of $349.95, along with a Panasonic printer listed at $369.95. Rumored to be in the works for the summer of 1983 was a disk drive which probably never materialized. 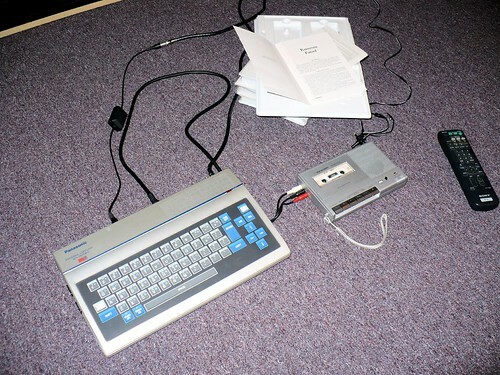 Also included in the initial release was a new 2400 baud cassette player, Model RQ-8300, which was four times faster than standard cassette players. 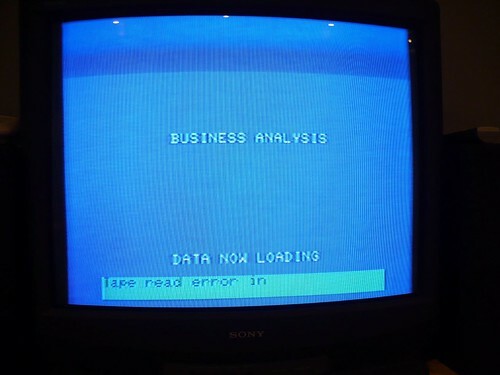 By December of 1983, it had become obvious despite the early optimistic appraisals, that the Panasonic JR-200 was finished in the American market. Intense price pressures, fierce competition, and the great video game crash of 1983 were all contributing factors to the demise of the JR-200u. 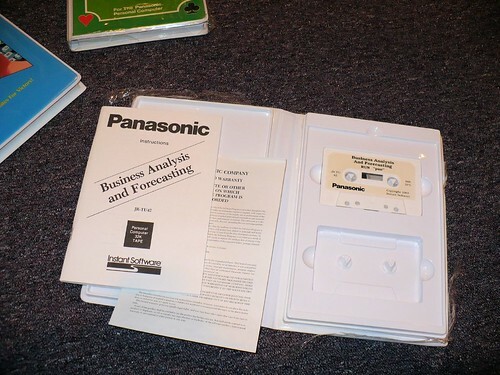 Sales results were so bad that Panasonic announced in late December 1983 that the JR-200u would be pulled out of the consumer electronics division entirely and given to the business and industrial division. Panasonic appeared to have problems penetrating the American market according to assistant general major of Matsushita's Panasonic subsidiary, Bill Kopp, who noted at the time; "My over-all impression is that the U.S. market is very unstable." 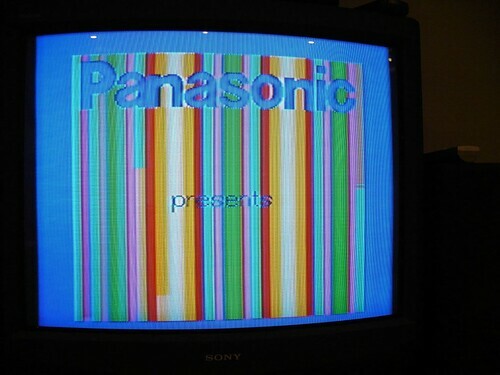 Given the fact that the Panasonic JR-200 was only sold in high price department stores like Macy's and Bamberger's, it is no wonder the computer failed to sell. Many of the most popular discount retailers were ignored in order to avoid direct competition with cheaper U.S. brands. Despite efforts to drop the price of the JR-200 to $269 with software bundle included, the computer never caught on with the public. 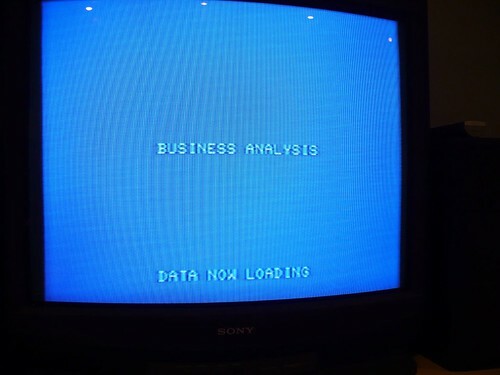 By February 13th 1984, Panasonic announced the discontinuation of the JR-200 computer, indicating an unwillingness to match rock bottom prices of other manufacturers. Apparently $250.00 was the threshold price level not to be broke. 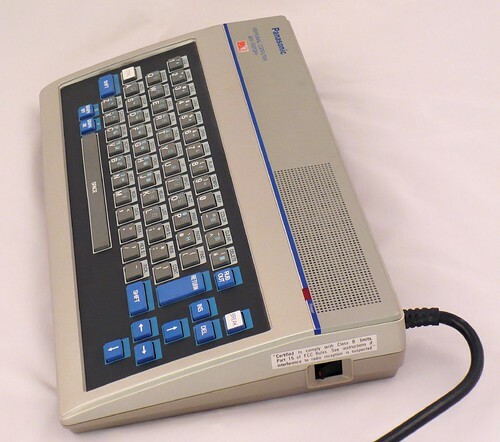 UPDATE: Be sure to check out the continuing saga of the Panasonic Personal Computer (PPC) JR-200U, here. Wow cool to see that old Panasonic system brought to life! 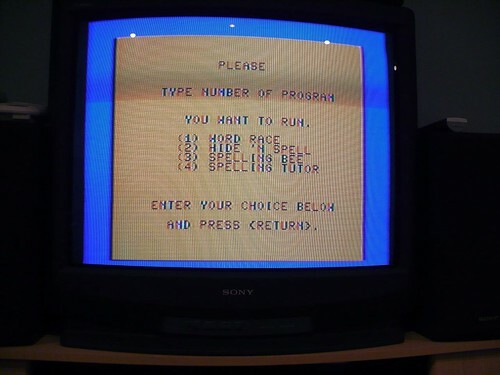 Back in the days you really had to know all the weird idiosyncrasies of the various systems to actually get by as a computer literate person. How to get the directory from a disk or how to load a program from tape by typing in the necessary commands. Bill you probably need all that sort of knowledge ready in your head when you want to use various old systems - or do you actually have some sort of catalog / database regarding that sort of things. Perhaps the MESS database will help? I wonder if the system is Emulated in Mess? The system does have an emulator, but as far as I know, it's not part of MESS. This system is definitely unique in that there really is a dearth of information out there. Most other systems, regardless of make, have at least some operational information available or people you can turn to. If those manuals do ever turn up from J&R, I'll be in business and can then share the information. In regards to your other thought, I've often considered creating a multi-system cheat sheet with the various load, save and format commands. Sometimes you do just want to get right in and use a system without having to weed through the manuals or try to track information down on the Net. 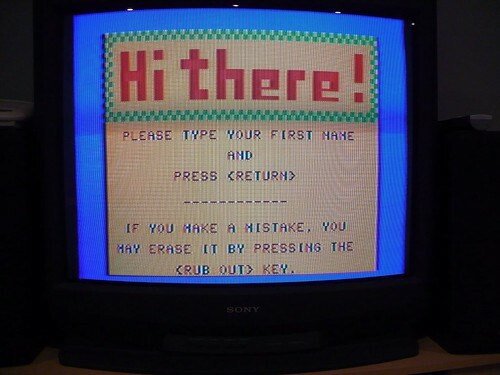 Its green startup screen is so CoCo3 / VIC-20. Scary that it had by that time gone through 5 majour revions of an unknown dialect of basic. 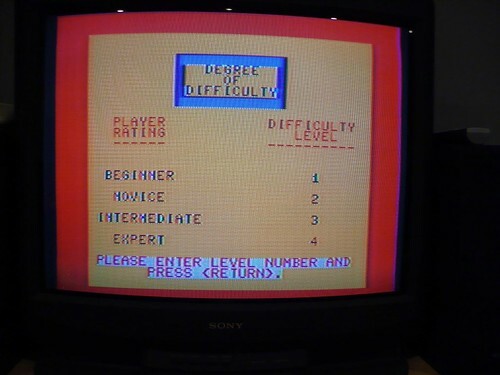 32x24 is also kind of odd when everthing else was pushing to 40 column displays. 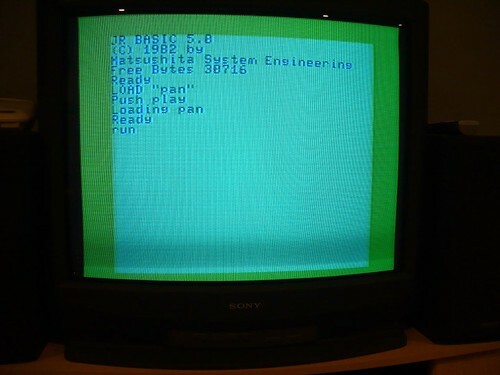 Kind of amazing to think it came out post C64 when you compare its capabilities. Why kind of market could an inferior product capture? Someone should have seen the writing on the wall long before its commercial release. Even the coco2 released in 83 beat it down. Its a very odd product. Like someone coming out with a new leaded gas car now everyone is on unleaded. Very interesting none the less. Very odd choice of cpu, 6802 clone... 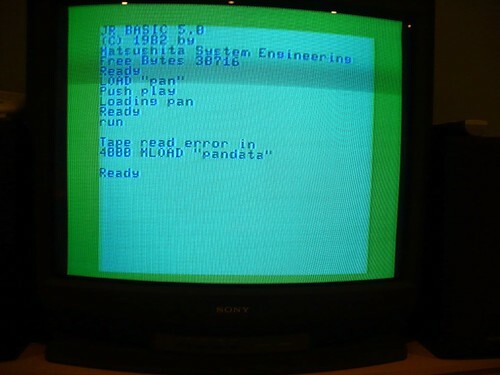 They could have had a 6502 for cheaper. I guess they were manufacturing them already and just used what they had in house. It's interesting that contemporary reviews rated its BASIC implementation as the fastest and most accurate, so that's certainly something in its favor. 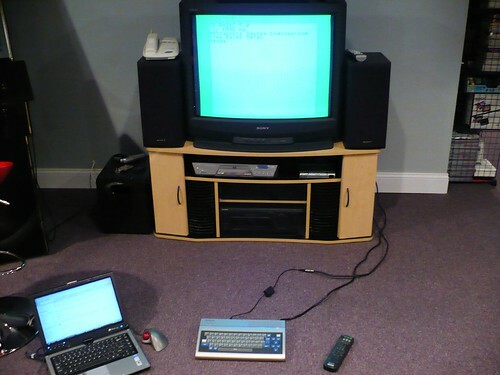 It's actually constructed well, despite the chiclet keyboard and it was obviously capable of decent displays pre-program. I wonder if any of the other software ever released was anything but in BASIC? 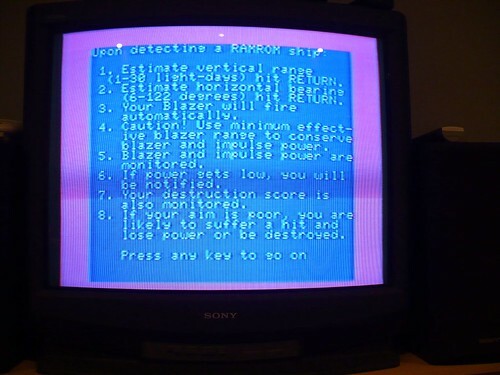 Some of the screenshots on the Old-Computers.com Website seem to indicate this may have been so. What I find most interesting is that the Mattel Aquarius is considered the ultimate technological bomb and that was released around the same time. It's true that the Aquarius was inferior on almost all counts, but it also had the benefit of professional programmers who actually were able to make and release decent software. Even with the pedigree of Datamost, I was surprised at the overall lack of polish in the few software titles I have (though at least the Datamost one does something resembling graphics). What I find most funny is that this is supposed to have three channel sound, but all I ever heard were Pong-like beeps. Very odd. A lot of this is probably a result of all the software being written in BASIC. I bet a decent ML program could actually show what this system was capable of. 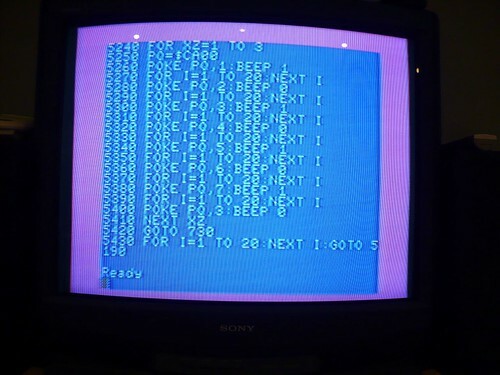 This is an obscure system, but no doubt there are those few webizens who will remember it fondly from their youth--after that jolt of "MOM, this isn't a Commodore 64!! You got the wrong thing!! Oh, well." LOL. 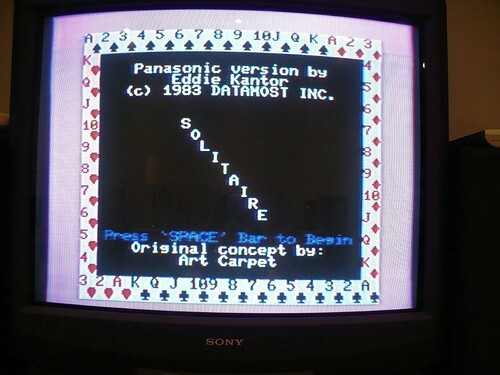 Funny too that it says "Written by: Eddie Kantor" and "Concept by: Art Carpet". In the manual it just says "by Art Carpet". Seems to me the guy actually doing the coding is more important than the guy saying, "Hey, why don't you make a solitaire game, Eddie? ", but that's just me. Still laughing at that one...! It's hard to imagine some cheesy monster who actually used the moniker Art Carpet on a professional release. Geez, the industry was soooo amateurish back in those days. In the Compute article you quoted it mentioned RGB out for video. I didn't think that any home based machine at this time could do RGB-Composite or RGB-H-V-sync. Most of those monitors would have cost 10-20 times what this machine sold for. Is this just bad marketing information passed to a unknowing article writer or could this machine pump RGB+some synch output? That's a great point I didn't consider. Since this was obviously meant as mostly a low-end system, it is rather odd for there to be anything but the TV output. My only guess would be that it was endemic to the chipset that it could output RGB. 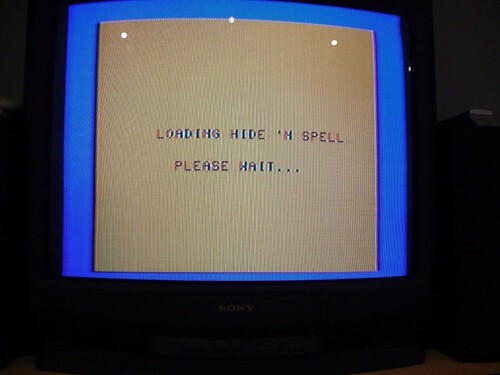 I'll see if I can dig up any compatible monitor/cables tonight if I have time, as I"d be curious what the output is like on that connection. It would be rather odd for a 1983 (1982 if you consider Japan) to have such support, since RGB really didn't come into its own until a few years later. Spurred by Cecil's comments, I decided to try and get the RGB output of the JR-200U going. 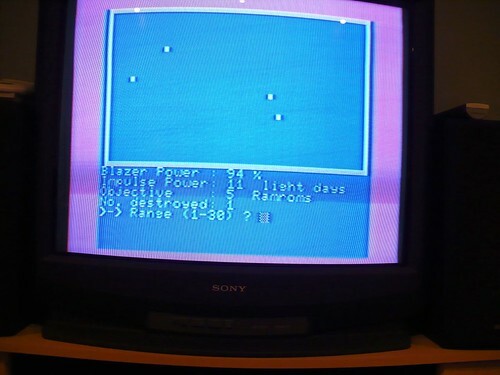 At first I grabbed my Sinclair QL cable, but that didn't quite work since it had two of the same connector on each end and my Commodore 1084S couldn't resolve the signal (and frankly, I'm not even sure if that was a QL monitor cable or not). Then I thought that the Sega Genesis (original model) had the same connector, but I didn't have ready access to it in the pile of Sega stuff. So then I remembered that my SNK Neo Geo AES had the same connector. 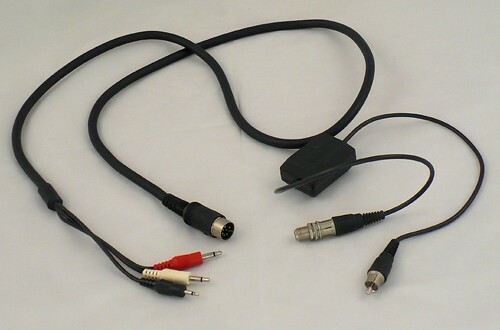 I grabbed the composite mono cable from that system (no need for the stereo one) and plugged in only the video output (yellow connector) to the 1084S since the Panasonic does not generate sound on that same output and selected the correct mode on the monitor. Sure enough, I saw a CRYSTAL CLEAR display. Unfortunately, I still could not get a sync on my video capture device. 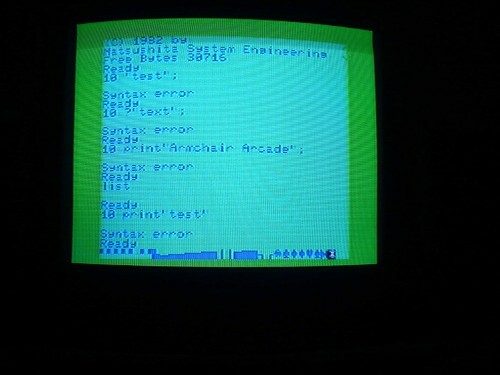 This is obviously NOT real RGB output since it's not the right connector end, but it does prove that the port generates a clean signal (composite in my test case) and in theory should work just fine with the right hookup and monitor combination. Video out it is, but is it more? So then I remembered that my SNK Neo Geo AES had the same connector. 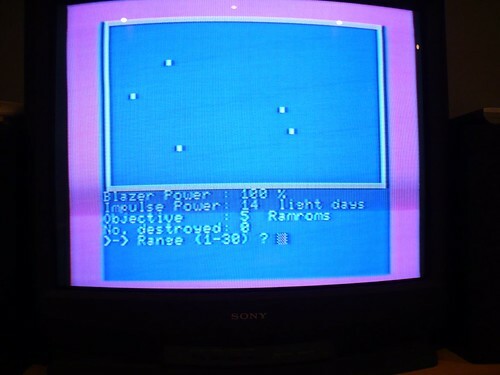 I grabbed the composite mono cable from that system (no need for the stereo one) and plugged in only the video output (yellow c onnector) to the 1084S since the Panasonic does not generate sound on that same output and selected the correct mode on the monitor. Sure enough, I saw a CRYSTAL CLEAR display. OK now I am totaly confused. What did the Neo Geo AES output? I See you mention composite Mono, so this is not the fabled RGB. Is this just a lucky Video out connection? And did you get any audio? What plug configuration does this machine have and are there even enough connections to have SGround Composite connections plus R+G and Sync+B or a true R+G+B+S signal? ASCII up a diagram or shoot a pic of the backside of this strange beast. You have a high resolution picture of the backside in the article above. If you click on the image, you go to the photo's main page and can click on "All Sizes", which will give you the full 7 MP image. Same goes for all the other images. There is no sound output over the cable. It's video only. Both connectors are - the RGB and TV out. You can see in the image that the audio out is separate. If you don't use that, it just uses the built-in speaker, which can be seen on the upper right of the top of the unit. It's the same exact port as found on systems like the Sinclair QL, Sega Genesis and SNK Neo Geo AES, so I just used the composite cable (video only) from the Neo Geo, since that was handy. I don't seem to have any compatible cable that I know of that will go to the RGB port on any of my RGB monitors.